Reef Catchments, the O’Connell River community, Australian Rivers Institute (Griffith University), Department of Natural Resources and Mines, Rio Tinto and Pioneer River Improvement Trust are collaborating on a demonstration reach and ecological monitoring program on the O’Connell River. The demonstration reach will determine the structural effectiveness and cost benefit of Engineered Log Jams (ELJ’s) as an alternative engineered solution to streambank instability and their contribution to ecological and geomorphological enhancement of high velocity tropical stream systems. The effect of river flow, water hole persistence and barriers on fish community abundance and diversity are also being investigated. Read about the O’Connell River Stability Assessment..
Read more about the O’Connell Restoration in the O’Connell River update November 2012. 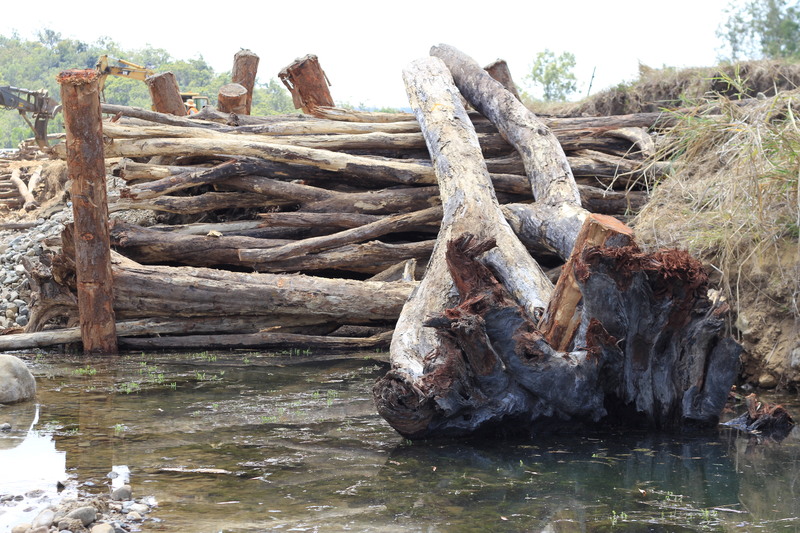 More detailed and technical information on Engineered Log Jams is available in the report Design guideline for the reintroduction of wood into Australian streams, written by Dr Andrew Brooks, Australian Rivers Institute, Griffith University. First complete engineered log jam at the site! Reef Catchments river restoration program works with individuals, land managers, local government and industry groups to encourage shared responsibility, stewardship and wise use of water to increase resilience of river systems. Through these partnerships river restoration projects focus on improving water flows for fish, restoring river and estuarine habitats. Projects also aim to enrich stream productivity, encouraging community participation and facilitate adaptive water management plans that are designed to lesson impacts of climate change. River project activities enable groups to recognise that human behaviours threaten their local catchment and then offer strategic support, coordination and resources so that they may increase river resilience and be the agents of change. The Gregory River community worked closely with Reef Catchments and James Cook University on the pilot project, “Collaborating Across Boundaries”. The project developed an innovative conservation planning model that relies on community direction for prioritisation of on-ground activities. Based on the Gregory River pilot, the Collaborating Across Boundaries model is now been rolled-out as part of the O’Connell River Restoration and Research Project. For more information, please download the Gregory River Restoration Project Brief. The movements of barramundi, jungle perch, mangrove jack, tarpon, bullrout and sea mullet tagged and released in August last year are being tracked in the O’Connell River and larger tributaries. Reef Catchments are collaborating with the Department of Natural Resources and Mines and Department of Agriculture, Fisheries and Forestry on the project, which aims to better understand movement patterns of the targeted species within the river systems and out to sea, as well as how river flow, instream barriers and habitat quality affect fish movement. If you catch a tagged fish, please return to the point of capture, call SUNTAG on 1800 077 001, and advise them of the tag number, species, recapture location, date and length. Here is more information and photos of the target species.